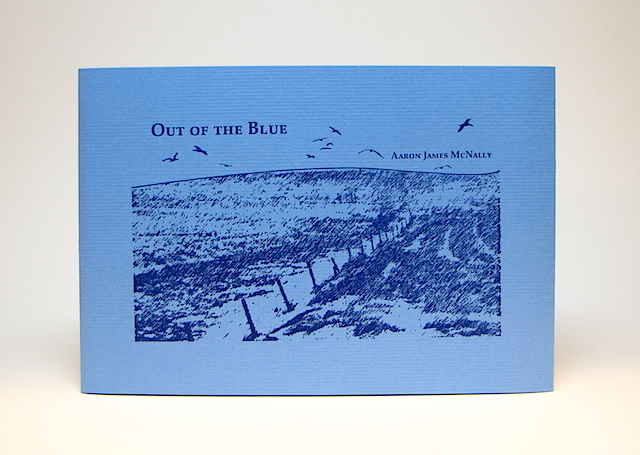 Out of the Blue, poetry by Aaron James McNally, 2007, 32 pages, letterpress edition of 250. Aaron McNally’s poetry is driven by rhythm and sound, but guided by emotion. As readers, we are challenged to pinpoint the complexities of emotional expression each poem contains. Simultaneously, a strong cerebral bent works an angle on meaning that uses metaphor, imagery, juxtaposition, poetic form, and an inner narrative voice. Where we end up rests on our ability to take a journey, propelled along by rhythm, absorbing the emotional atmosphere, our destination up for grabs as McNally sets our heads spinning, then gently, with careful consciousness, sets us down. Aaron James McNally has a Master’s in English from the University of Northern Iowa. 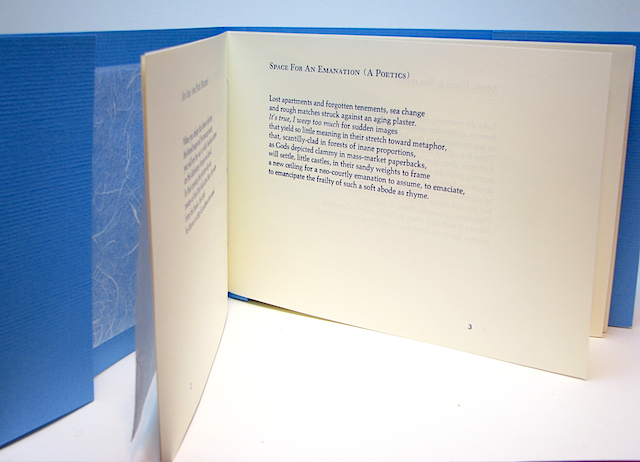 His collaborative poetry with Friedrich Kerksieck has appeared in several magazines and as two chapbooks. He has edited and published several local chapbooks and small publications and served as the design editor for The Cream City Review. 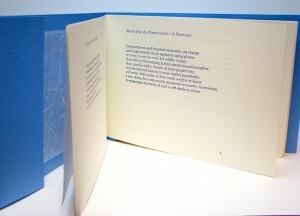 His reviews of poetry have appeared in Rain Taxi. Out of the Blue is his first book.